For marinade: In a small bowl, stir together nectar, snipped or dried mint, 2 tablespoons of the green onions, the Pickapeppa sauce or spicy brown mustard, oil, lemon juice, salt, and hot pepper sauce. Remove 1/4 cup of the marinade; cover and refrigerate until serving time. 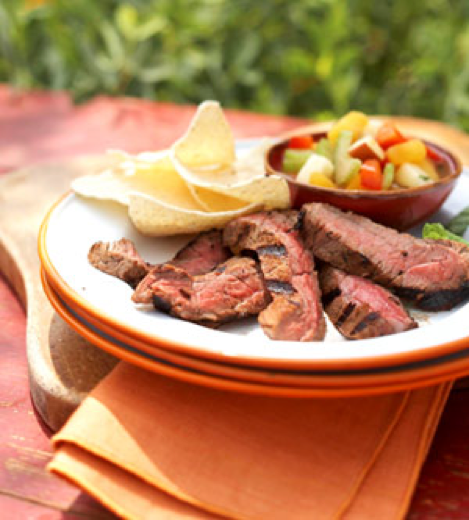 Place steak in a resealable plastic bag set in a shallow bowl. Pour remaining marinade over steak. Seal bag; turn to coat steak. Marinate in the refrigerator for 12 to 24 hours, turning bag occasionally. For fruit relish: In a small bowl, combine sweet pepper, apple, mango, celery, and the remaining 2 tablespoons green onions. Cover and refrigerate for up to 24 hours. Drain steak, discarding marinade. Place steak on rack of an uncovered grill directly over medium coals. Grill until desired doneness, turning once halfway through grilling. Allow 14 to 18 minutes for medium-rare doneness (145 degrees F) or 18 to 22 minutes for medium doneness (160 degrees F). To serve, thinly slice steak across the grain. Serve with fruit relish and drizzle with the reserved 1/4 cup marinade. If desired, garnish with mint sprigs. Makes 4 servings.